This cherry compote is a nice addition to desserts, crepes and cakes. It is vanilla-scented and aromatic. 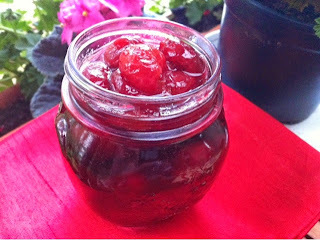 When I cooked this version of compote its cherry and vanilla rich scent spreaded aĺl over kitchen. It was lovely. My next was to make a cheesecake. How delicious it would be to spread cherry compote on it. Nam! Firstly I removed stones from cherries.I tried to keep cherries in their own shape as much I could so as to compote would seem fine. root side of cherries. Of course you can use stone remover if you own it. Then I put cherries, jam sugar and cherry wine into kettle. After that I split vanilla bean and added it into soup. Then I brewed cherries slowly as long as cherries seemed nearly translucent. But they were still snappy. If I remember right it took about 15 minutes. Finally I let cherry compote to get cool. I threw the split vanilla bean into compote to give taste to it.